Dean's Minis is a family run independent business started by Dean Theobald. 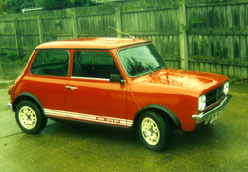 Dean first had a Mini back in the 70's and spent many hours changing engines, gearboxes, panels etc. He would help friends with their Minis and became known as 'Mr Mini'. He even brought his first daughter home from the maternity hospital in the 1275 GT shown here. The principle of Dean's Minis grew into its present day form as a business specialising in Minis. We were formerly known as 'Mr Mini' but this had to be changed. For an explanation go to 'Why formerly Mr Mini'. We have been at our current premises since 2004 but have been based in Soham since 1994. We have our own workshops offering mechanical repairs, bodywork with in house spray booth, new & used parts, conversions and almost anything to do with Minis. This picture shows one of our workshops. 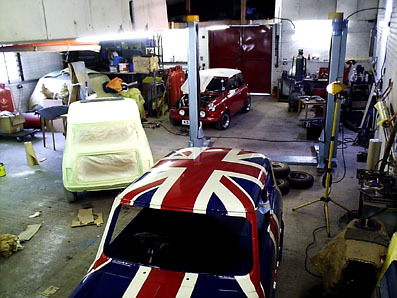 The Union Jack shell is one of our hand built Minis underway.